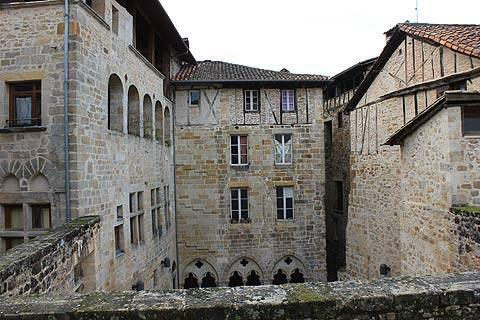 Figeac is a substantial medieval town in the Lot department of the Midi-Pyrenees, about 70 kilometres east of Cahors on the River Célé. In the town there is an extensive and interesting historical centre, dating in part from as far back as the 9th century, and the town still has many houses and small palaces dating from the 13th - 16th centuries, when it was an important trade centre. 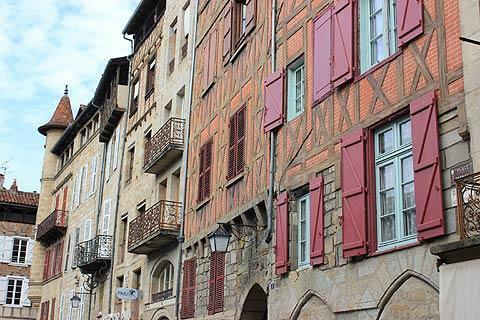 France This Way comment: Figeac is a lovely town that you must visit when you are in the region! 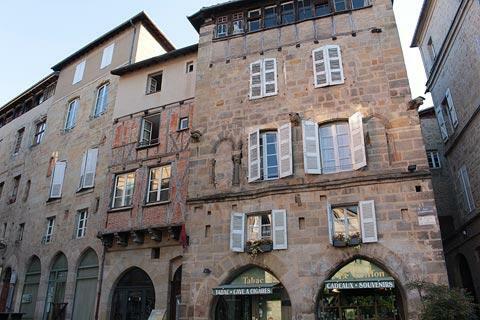 Although it has many impressive buildings it is the charm of historic Figeac as a whole that is its main appeal, rather than any one particular highlight. 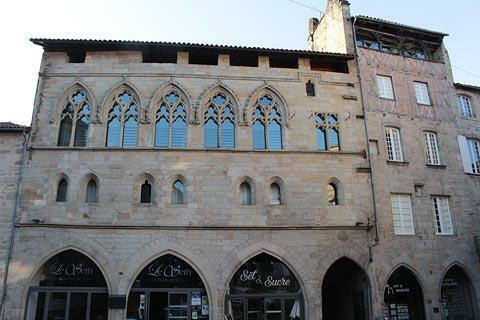 Start your visit at the 'Hotel de la Monnaie' in the south-east of the town centre: this is a very well preserved house from the 13th century which features arched windows and an unusual round tower and is now home to the Figeac Tourist Office. 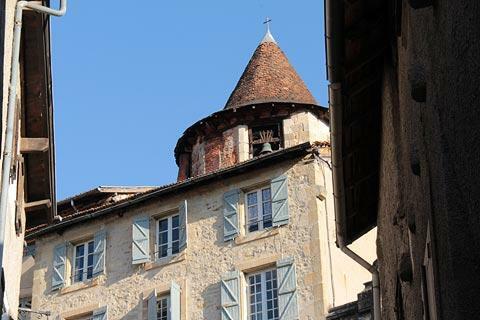 In the tourist office you can ask for the leaflet which suggests a route to follow when exploring the centre - there is a great deal to see in the heart of Figeac and a great deal you will miss if you simply stroll around. Note that the version of the city guide called 'Les Clefs de Figeac' for which there is a small charge (30 cents when we visited) is much more useful than the free version! 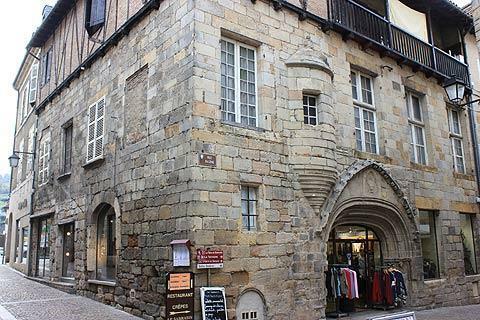 From the tourist office you can continue into the streets just east of the Hotel de la Monnaie, such as the Rue Balene and the first part of medieval Figeac. 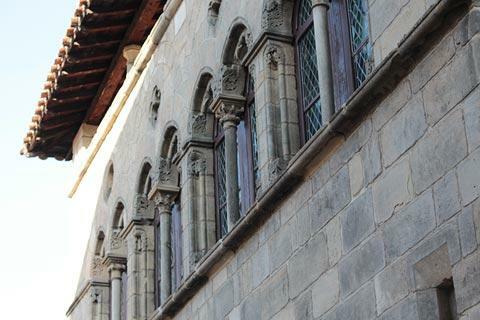 There are two interesting buildings on Rue Balène: the Palais Balène at number 7, with the porch and upstairs windows very typical of the gothic style; and the Hotel d'Auglanat at number 1 which has retained the elegant 14th century stone carvings around the doorway. 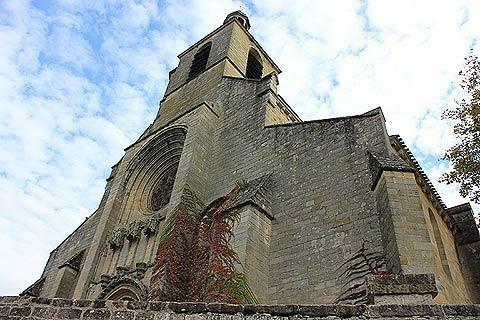 You will quickly reach the Church of Saint-Sauveur, one of the two main churches in Figeac and the biggest in the town. 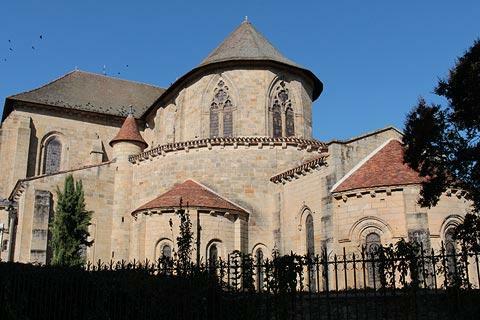 This church was originally part of a benedictine abbey, around which Figeac originally developed (although the church has been substantially reconstructed since). The main town centre is to the north of here, in the streets around the Place Carnot and the Place Champollion. The narrow medieval streets are now busy with the shops and cafes that occupy the ground floor of many of the buildings. The Place Champollion in particular is very lively with several cafes here having outdoor terraces. 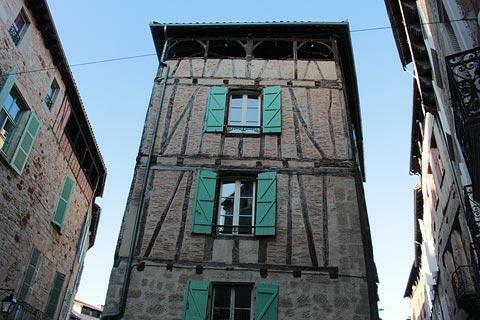 The old colombage houses, houses with first floor balconies, and narrow streets lined with ancient stone buildings and ornate carvings form a lovely ensemble. In the town centre many of the houses still retain the medieval arcades at ground level. 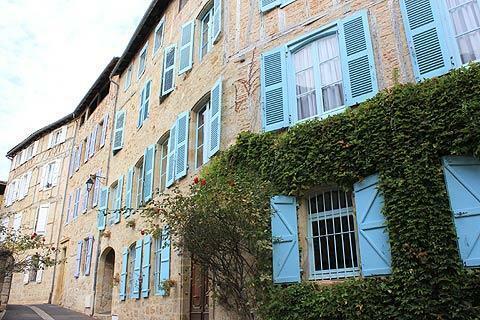 There are many interesting houses in Figeac. Among these try and see the Hotel Galiot de Genouillac (12, rue Roquefort) for an example of renaissance architecture, the ornately decorated Hotel Dumont (on Rue de Clermont) dating from the 14th century and the house with a small tower above an arch at the Maison à Tourelle d'Angle (Place carnot). 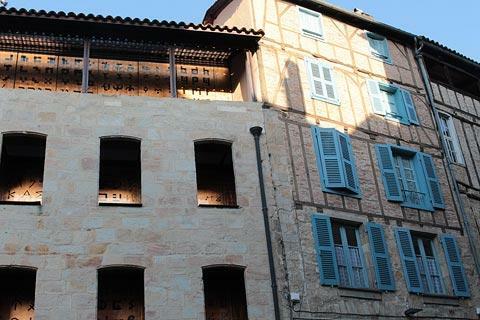 The 'Museum of Ecriture' in Figeac in a modern redesign of a medieval building on Place Champollion is a very interesting, and looks at writing across the centuries, including an explanation of how the writing on the Rosetta Stone was decoded. 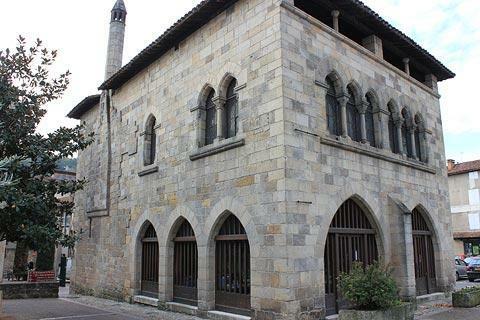 The museum is based in Figeac because it was the birth place of Francois Champollion, renowned for his work in deciphering egyptian hieroglyphics - the museum is based in the house where he was born. Follow the small alley to the left of the Museum of Ecriture to reach the Place des Ecritures, where a room-sized copy of the rosetta stone occupies much of the floor area in a pretty courtyard. 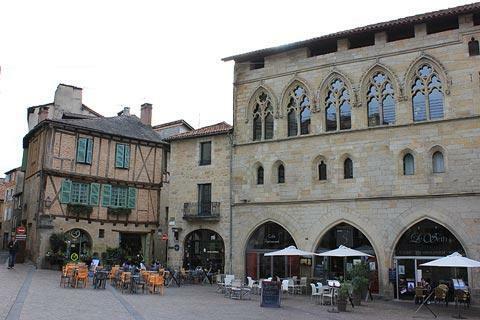 Just above this square is a garden area and access to the 'Espace Patrimoine ('Heritage Space') which is an invaluable guide to understanding the history of Figeac. The Rue Emile Zola also starts at Place Champollion and is one of our favourite streets with many interesting buildings. 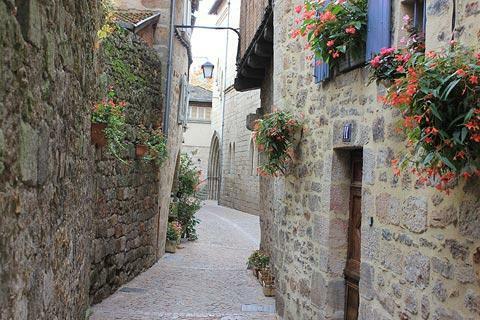 From Rue Emile Zola you can follow one of the steep alleys on the left such as Rue Delzhens which climb the hill to reach the second church in Figeac, the Church of Notre-Dame-de-Puy. 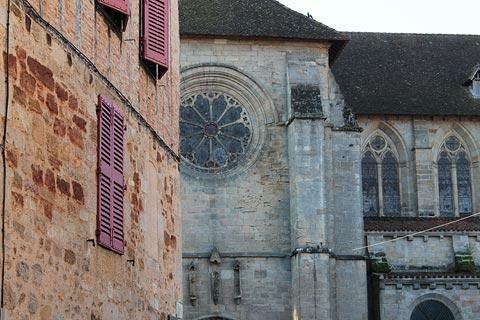 Standing high above the town, and largely a 17th century rebuild of a 13th century church, inside you can see an impressive altarpiece while outside you can look down on the rooftops of Figeac. 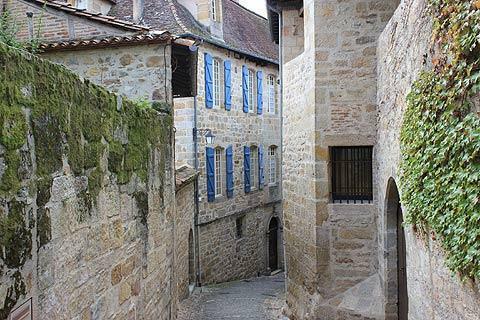 You can follow a different alley back down the hill (perhaps the Rue Saint-Jacques) to see more of the extensive historic centre of Figeac to the west of here. 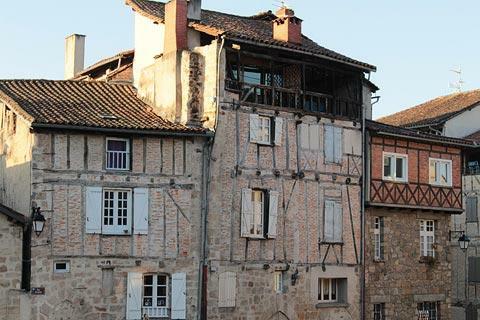 After exploring the centre you might like to visit the hill called the 'colline de Puy' for a nice view across the town. 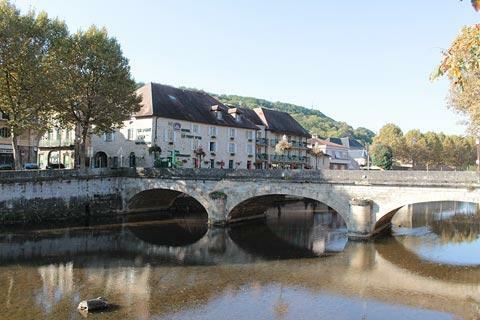 You could also take a stroll along the banks of the Célé river on the southern edge of Figeac - although personally we would probably just spend more time in a cafe in the historic centre! The weekly market in Figeac takes place on a Saturday morning. 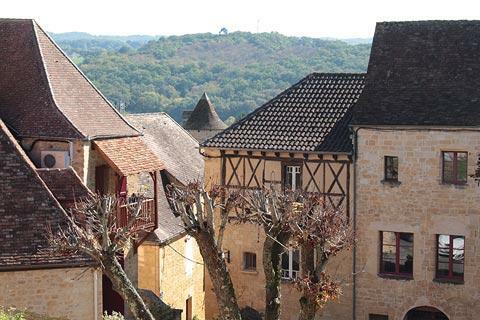 Steep wooded valleys, plunging cliffs, small medieval villages and far-reaching views are all to be seen in the area around Figeac and of course the region also provides ample scope for casual exploring or more serious outdoor sporting pursuits. The Lot Valley around Figeac is exceptionally scenic (among the most attractive in France, in my opinion) with the routes that follow the River Célé and the River Lot downstream among the best ways to explore. There are several small villages of interest close by. 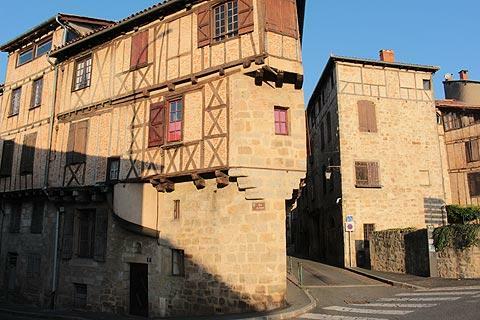 A little south of Figeac visit the historic village of Capdenac to see the fortifications and castle remains, and to the north you can visit Cardaillac - both of these villages are classified among the 'most beautiful villages of France'. 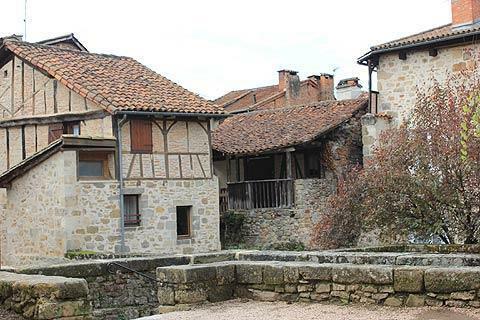 You will see many other villages as you travel round with Faycelles and Cajarc being among the most interesting. Often it is the imposing position of the villages that is as impressive as the villages themselves. At Assier to the north-east of the town the Chateau d'Assier (or at least, the substantial wing that is all that remains of the original) dates from the first half of the 16th century and has some elaborate ornamentation.